First, John Boys and his Logworks team worked closely with our proffessional design team of Architects, Structural Engineers and Building Code Consultants, to finalize the details of our performance based heavy timber roof structure design comprised o over 492 beetle-killed pne logs. 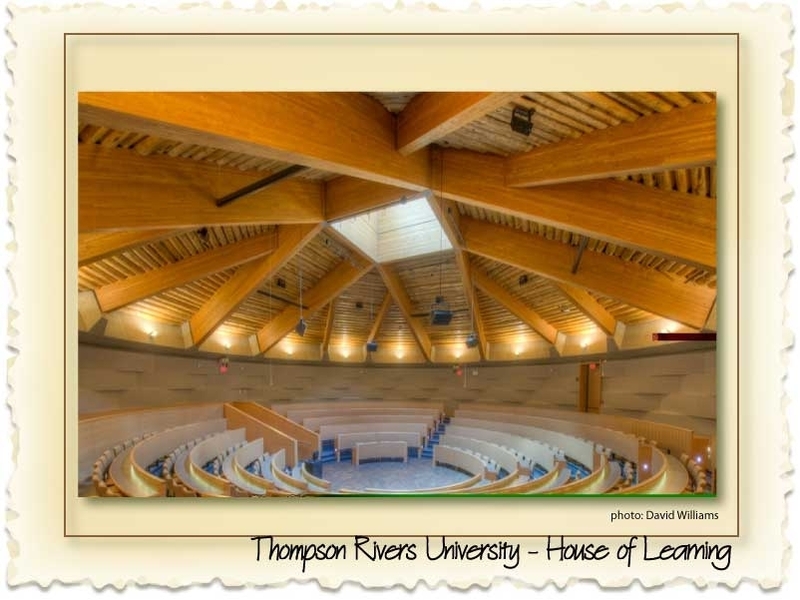 The completeed design creates a clear span composited log/glulam structure of over 85 feet supporting a green roof and large 180 sqft skylight over a 320 seat auditorium in the round. John's design input included work on log species sourcing; log preparation and production; finishing and grading specification; composite panel design positioning and installation strategies. Joh's experience and wood/timber industry insight translated into capital cost savings for our project without sacrificing design entegrity. Secondly, Nicola Logworks also provided construction services for log production and installation associated with the project;s auditorium roof as the awarded low bidder procured through BC Bid. John and his crew were further responsible for the highly technical installation of glulam wind girt structural mullions behind a 3 storey composite wood curtain wall system, including the sinstallation of a glulam roofing structure which supports 800sqft of skylight over a4 storey interconnected atrium space. Nicola Logworks worked closely with the construction manager Vanbots Construction in a fast track project environment, and was able to accelerate their compnent of the work schedule. The design team is proud of the House of Learn Prjoject, and we feel that John Boys and Nicola Loworks have played a positive role in the complex project delivery process with contribution to both design and construction through attention to detail, project preparation, and their knowledge and passion for the celebration of wood. We look forward to future collabrations, and wish Nicola Logworks success in their future endeavours.